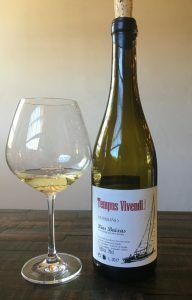 2017 Nanclares y Prieto, Albariño “Tempus Vivendi Rosina” Rias Baixas, Galicia, Spain. Nanclares y Prieto, led by Alberto Nanclares and joined by the youthful talents of Silvia Prieto, has fast become the go to Albariño estate in Spain’s Rias Baixas with their handcrafted biodynamic/organic wines. Based in the Cambados zone, Nanclares’ estate wines are unique Atlantic influenced Albariños grown at sea level on a mix of sand, clay and granite soils that allow these wines to display a deep saline quality as well as a striking mineral core, these are as authentic and as pure as it gets, and in some cases rival classic Chablis and Mosel Rieslings in personality and expression, especially in vintages such as this 2017. The Nanclares y Prieto Tempus Vivendi comes from 6 parcels in the parroquias (or parishes) of Vilalonga, Noalla and Dorrón close to the municipality of Sanxenxo along the Atlantic coast in the famed sub zone of Val do Salnés from historic and traditional Pergola trained and grown vines that range from 25 to 40 years old. This bright, but richly flavored 2017 Tempus Vivendi was pressed whole cluster and fermented in steel tank, allowing native yeasts and non malolactic conversion, to preserve its natural freshness and retain high acidity. While crisp and zippy, this Albariño was raised on the lees over winter, which adds wonderful texture and mouth feel and was bottled with very low levels of SO2, and was neither clarified or filtered. The nose has white flowers, salty stones, citrus and orchard fruits along with a brioche note all of which transfers to the palate inshore detail as well as lovely apple, peach and key lime fruits. This zesty wine is crunchy and stony with wet rock and energetic vitality, but is ripely generous and complex, making it joyous with a wide variety of cuisine options, but of course it is ultra special with sea food dishes from paella to steamed mussels, plus briny oysters and or sardines. This bottling is a tribute to Alberto’s great passion for sailing and the wines true soulful connection to the sea, I love these wines and almost every vintage is a treat, especially the regular estate version along with this Tempus Vivendi and the tasty little Dandelion cuvee, and while limited and mostly hard to find they are well worth the extra effort it takes to get a few bottles, drink up.